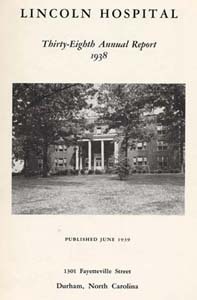 Lincoln Hospital (Durham, N.C.) Thirty-Eighth Annual Report, 1938. African American nurses -- Training of -- North Carolina -- Durham. African American physicians -- Training of -- North Carolina -- Durham. African Americans -- Medical care -- North Carolina -- Durham. Hospital benefactors -- North Carolina -- Durham. Hospitals -- North Carolina -- Durham. Lincoln Hospital (Durham, N.C.) -- Finance. Social service and race relations -- North Carolina -- Durham.